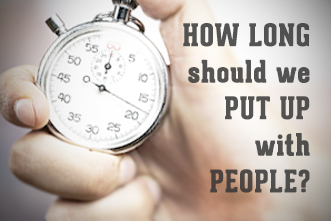 How Long Should You Put Up with People? Home Outreach Leaders Articles for Outreach & Missions How Long Should You Put Up with People? I always check the expiration date on the milk carton, making it even more of a surprise when I recently took a swig of sour milk. I knew it was not polite, but my reflex overruled my etiquette and I spewed the putrid substance from my mouth. I like milk but it has time limitations. Just about the time I think I have the fastest computer or smartest phone, I see an advertisement for one that makes mine look obsolete. Most of the products we purchase today are not necessarily engineered for long-term use because a short life-span is economically beneficial. I like gadgets, but they have time limitations. • Don’t commit if you are not committed. This is not double-talk; this is straight talk. If you are not going to follow through then do not commit to any accountability relationship. • Define the terms of the accountability relationship in advance. Some accountability relationships are deeper than others. There is a difference in holding a friend accountable for being on time to a meeting each week and using accountability as a genuine discipleship tool. • Discuss what the accountability relationship will look like and agree on the terms. The law of expectations is vital in accountability. If you do not communicate expectations it may destroy friendships or your ability to effectively minister to that person. • Determine systematic evaluation points. It is vital that you periodically evaluate the personal progress or lack thereof in the accountability relationship. Pre-set evaluation points will aid in motivation and take some of the sting out of correction if it is necessary. • Defensive attitudes will nullify the accountability process. Transparency from both partners is required for this to be profitable. • Depend on the Holy Spirit to know when to let go of an accountability relationship if it is just not working. If the person consistently refuses to move forward in their faith or to even take small goals seriously, it may be time to turn your attention to another person. Things have time limits but relationships don’t. Accountability is more than a process, it is a relationship. How do you know when to stop the accountability relationship? I am not sure it ever really ends as long as two people are motivating each other to grow spiritually. It may go on indefinitely but will likely morph over time as each person grows and moves forward in their faith. Previous articleWhen Should You Split Middle and High School? As a dynamic and articulate communicator, Mike speaks to thousands of students, leaders and youth pastors through a diversified ministry of camps, conferences and evangelistic events. He has a deep burden for evangelism, discipleship and development of future leadership. Mike has co-author several books, including Where Was God When, The Greenhouse Project and has written the Where Do I Go from Here? Interactive Discipleship Series. He continues an ongoing writing ministry and has produced multiple DVD’s for teens and local church leaders. He maintains a full travel schedule and preaches both nationally and internationally in churches, youth events, leadership conferences, colleges and seminaries. Mike is the Executive Assistant to the President for Ministry Development and makes his home in Schroon Lake, New York, with his wife, Betsi.